.ShaderTextLabel: Shows or hides the shader text editing inputs. Useful when you are no longer editing the shader and want the screen real estate back. 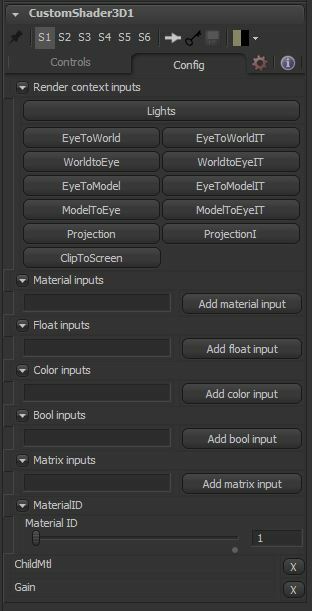 .ShaderTextInputs: Read only listing of the inputs provided by this shader. Formatted to allow easy copy/paste into ShaderTextBody. .CompileButton: Compiles the Cg shader including Cg inputs. Each shader is cached with a hash that allows you to store multiple compiled versions of a shader in memory. With very complex shaders or shader trees, the compiling process may be slow and will temporarily lock up the GUI, but once compiled, the shaders will execute as fast as your GPU will allow. .ExpandText: Momentary buttons to increase or decrease the number of lines available in ShaderTextBody. Useful for reducing scrolling and optimizing screen real estate. Not saved with .setting/.comp. .ShaderTextBody: Editable shader text. This text area does not have syntax highlighting, and in Fusion 7 does not have tab indenting, so for very complex shaders, it may be easier to use an IDE or even just a larger text editor and copy/paste into this. You can use includes to keep shader code in external files as well. In Fusion 7, you can use the mouse wheel to adjust the font size. UserControls area: Inputs are displayed here as UserControls, which allow for very easy customization with the UserControls script or with a text editor. .RCGroup: Shows or hides the predefined render context inputs. .UseLights: Gets the scene lighting array. Only needed for material shaders that interact with Fusion’s built in lights. .RCMatrices: Gets several standard render context matrices. Useful when the shader needs to operate in a space other than eye space, which is the default for the standard fragment interpolants like f.Normal or f.Position. .MaterialGroup: Shows or hides the material creation inputs. .AddMaterialName: Entry for the name of the material to be added. Names cannot begin with a number, must be unique, and certain keywords are reserved. .AddMaterialInput: Pressing this button validates and creates the named FuFloat4 and adds the corresponding inputs. A MainInput and an ImageControl are both created and can be used interchangeably. The input, by default, accepts MtlGraph3D, Image, and Mask types. This can be modified using the UserControls. .FloatGroup: Shows or hides the float creation inputs. .AddFloatName: Entry for the name of the float to be added. Names cannot begin with a number, must be unique, and certain keywords are reserved. .AddFloatButton: Pressing this button validates and creates the named float and adds the corresponding inputs. A SliderControl is created by default. Any Number control can be substituted and the min, max, default, etc. can also be customized with UserControls. .ColorGroup: Shows or hides the color creation inputs. .AddColorName: Entry for the name of the float to be added. Names cannot begin with a number, must be unique, and certain keywords are reserved. .AddColorButton: Pressing this button validates and creates the named float4 and adds the corresponding inputs. A ColorControl is created by default. This can be customized with UserControls. .BoolGroup: Shows or hides the boolean creation inputs. .AddBoolName: Entry for the name of the float to be added. Names cannot begin with a number, must be unique, and certain keywords are reserved. .AddBoolButton: Pressing this button validates and creates the named bool and adds the corresponding inputs. A CheckboxControl is created by default. This can be customized with UserControls, but the input will be evaluated as True if the Number is > 0.5. .MatrixGroup: Shows or hides the transform matrix creation inputs. .AddMatrixName: Entry for the name of the float to be added. Names cannot begin with a number, must be unique, and certain keywords are reserved. .AddMatrixButton: Pressing this button validates and creates the named float4x4 and adds the corresponding inputs to a named ControlPage tab. Each transform matrix added creates a new tab. .MaterialIDNest: Shows or hides the material ID input. .MaterialID: Sets the material ID for this shader. Default 1. .YourCustomInputNameLabel: Created when an input is successfully made. Read only. .YourCustomInputNameDeleteButton: Pressing this button will remove the corresponding input. This shader only works with Fusion’s OpenGL and OpenGL UV Renderers. Software rendering is not supported. Most shaders can be compiled for the software renderer, but they must be precompiled, which is out of the scope for CustomShader3D. If you would like to see a shader converted for the software renderer, contact us. Instancing CustomShader3D can create unpredictable behaviour when adding or removing inputs, especially materials. Avoid instancing if the inputs aren’t settled. Saving and loading the comp should fix any synchronization issues with instanced tools, but it isn’t guaranteed. Removing a material will still leave the MainInput in the flow. This is a visual artifact only, the material input is gone, but the flow does not update. Similar to how Merge3D does not remove inputs. This does not affect the render, and the tool will be drawn correctly the next time it is added or when the comp is reloaded. Fusion does not support float textures in the material viewer. If you are developing a shader that relies on float textures, be sure to view it in the regular 3D viewer with float texturing enabled. FUSION_ENABLE_CG_DEBUG_MODE. Suggested value: True. This will enable Cg compiler error output to the console. FUSION_CG_ERROR_LINE_PAD. Suggested value: 3. This sets the number of lines above and below the error that are printed to the console. FUSION_MAX_CACHED_MTL_SHADERS. Suggested value: 200. This sets the maximum number of compiled shaders that Fusion will cache. Once this is reached, old shaders will be begin to be flushed. Since Custom Shader 3D tends to create a lot of compiled shaders, keeping this high will prevent other shaders in your flow from being purged as quickly. As this number increases, the amount of RAM used for caching will increase. FUSION_MAX_OFFSCREEN_BUFFER_SIZE. Suggested value: 32. This sets the size of the “buckets” used by the OpenGL renderer to break up large renders into smaller chunks. Setting this low will increase interactivity and stability at the cost of slightly increased render times. List OpenGL Cg Objects. 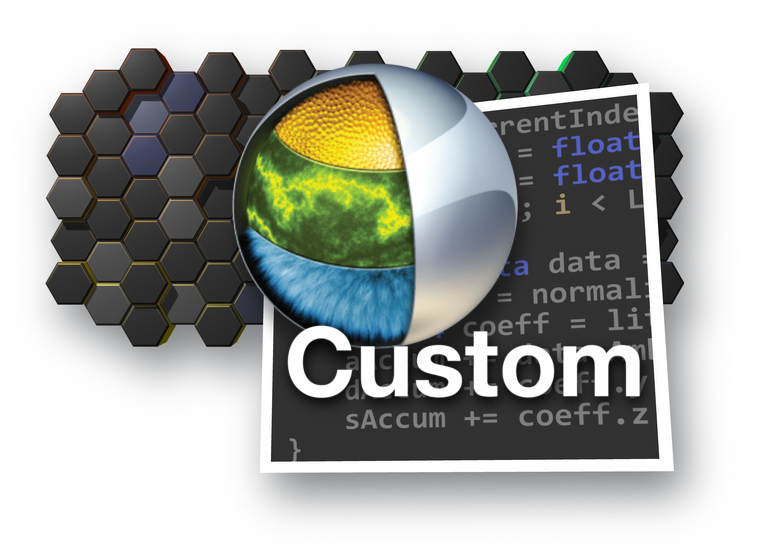 Gives you the source and compiled shaders of everything in Fusion. Helpful for debugging your shaders and seeing what the compiled results are as well as the uniform variables given to it. List OpenGL Objects. Very helpful in seeing what textures exist and how much memory they are using. Purge Material Shaders. Fusion caches shader strings, which improves performance tremendously. However, if you suspect that there may be a problem with one of the cached shaders, you can use this to manually clear out the cache and force the shaders to recompile. Material Shader Caching. This lets you turn off shader caching entirely. Certain issues may arise with the Cg compiler where perfectly normal shader code will fail to compile through no fault other than the Cg compiler provided by the GPU driver. Cg in Two Pages A 13 year old introduction to Cg, but does give the basic concepts in a concentrated form. The Cg Tutorial Book This book is quite old, but it does explain the general concepts of Cg and the examples are very easy to follow without trying to jump to advanced GPU programming topics that would be beyond that of fragment shaders. Cg language specification This page describes the Cg language and introduces useful concepts like swizzling and smearing and vector constructors. Cg stdlib reference This is a listing of the Cg standard library of functions. Custom Shader 3D does not directly address textures, instead using Fusion’s Texture2D, Spheremap, etc., so tex* functions can be ignored for now. Cg was developed in tandem with HLSL, and for the purposes of fragment shaders HLSL is virtually the same as Cg. If you can find resources for HLSL, they should map to Cg quite easily. GLSL is also similar, but there are numerous minor differences, some related to the differences between DirectX and OpenGL, and others are minor language differences. OpenGLES has caught on through mobile and WebGL 3D, so you can find resources related to that as well. An excellent new resource for GLSL fragment shaders is The Book of Shaders which gives practical advise on creating useful functions in the pixel shader domain.